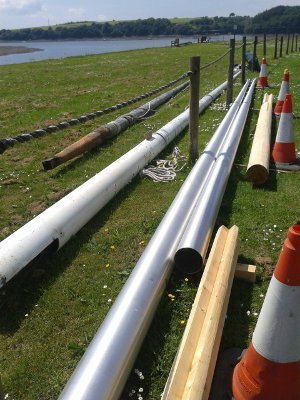 This entry was posted in junk rig, junk rig design, masts and tagged aluminium junk-rig masts. Bookmark the permalink. Just noticed this comment now. I’m a bit lax online! 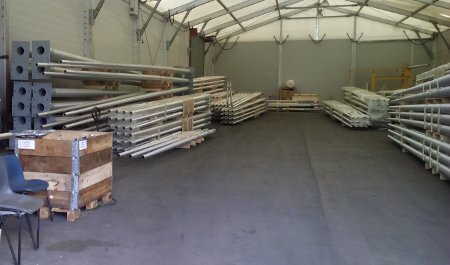 Both poles came out to approximately £1500 (including VAT at 20%!). 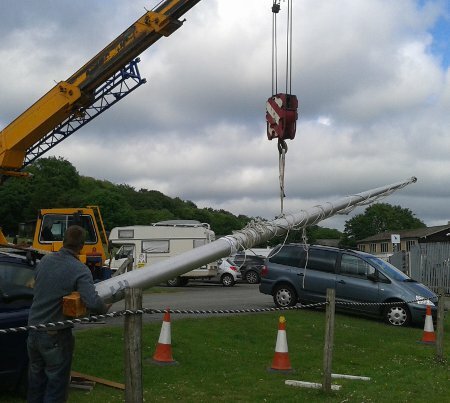 There was no extra charge for welding the masthead crane on. (I fabricated the parts myself from a 5mm aluminum sheet they gave me free of charge). Transport was not hard to arrange but cost me extra of course. Around £100 to Lawrenny I think. Can’t remember the exact cost. loved your site. Great to see some original, out side the box thinking on rigs. I’m installing some used carbon sticks in my plastic presto boat. I’m thinking of using rubber spartite donuts to relieve hard tohjard at the partners. Any thoughts? 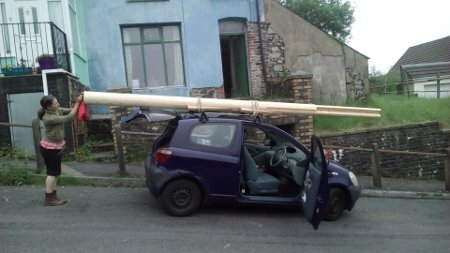 Sorry to follow up on quite an old post, but I wanted to ask about your mast strength. 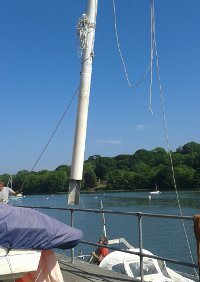 I’m thinking of doing a similar conversion on a Hartley 39 and thinking about unstayed (of course) aluminium masts. 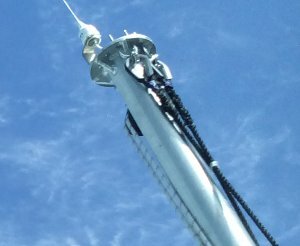 In my case, I’m looking at mast extending 10.7m above the deck supporting a 9.5m high sail (I’m going for a relatively low aspect ratio, 2, and 90 sqm total sail for SA/D of 20 and equal-sized sails; I haven’t looked into exactly where this would put the centre of effort yet, but it’s what I’m working with for the moment). I’m designing for winds up to force 7 (33 kt), assuming that if any gust higher than that is headed my way, I’ll have reefed before it gets there. The calculations are slightly back-of-fag-packet, but I’m working out a load of ~8kN at that wind speed on a 45 square meter sail. 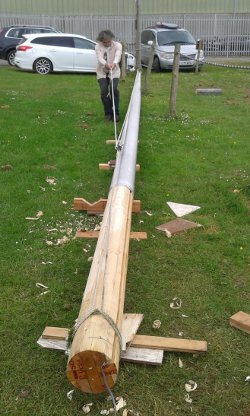 Using a mast that is 200mm across with 3mm walls and applying that over the length of the sail, the mast tip deflection is 3m, or just over 15 degrees, which seems worryingly large to me. 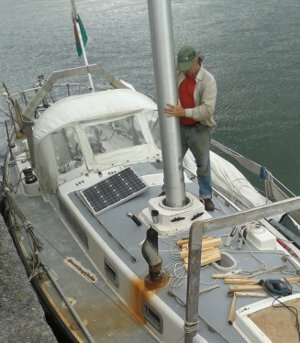 Of course, there are no safety factors in that calculation and your masts are also tapered, so the deflection will be higher. I’ve assumed 6061 aluminium (Young’s modulus of 69GPa); other alloys will be stronger. It’s quite possible that I’m overdesigning – I don’t have any good way of estimating the righting moment of the hull, so it’s quite possible that a 33kt gust square to the sail would just capsize the boat rather than bend the mast. How are your masts working out? Can you comment on the rough calculation above and give any advice?